American jazz trumpeter, composer and bandleader Miles Davis is considered one of the most influential and acclaimed figures in the history of jazz. He led the Miles Davis Sextet, which also included jazz greats saxophonist John Coltrane and alto saxophonist “Cannonball” Adderly, which was a fixture at the New York City jazz club Birdland in the late 1950s. The Robey Theatre Company, celebrating its 25th anniversary presenting work reflecting the experiences of the Black diaspora, is presenting the World Premiere of Randy Ross’s Birdland Blue at the Los Angeles Theatre Center. The action all takes place on a hot, humid night in August, 1959 at Birdland as Davis struggles with many issues. Ross has packed a lot into his 90-minute one-act. Davis (Marcus Clark Oliver) is desperately trying to keep his band together. Both the ever more religious Coltrane (Jermaine Alexander) and fast-talking Adderly (Damon Rutledge) are planning on leaving to head their own groups. Davis is trying to keep young bassist Paul (Rogellio Douglas III) off drugs while also trying to keep himself clean. He’s forced to deal with club manager Mo (Charles Isen) who tries to cheat him of his fee while Mo is trying to keep corrupt police detective O’Brian (Darrel Phillip) from increasing his “protection fee”. In the midst of all that, Davis is also trying to seduce magazine interviewer Lucinda (Tiffany Coty), who may not be as upbeat as she says. It’s a jam packed night. Ross has written a series of vignettes, giving each supporting character a chance to tell their story and to share the spotlight. 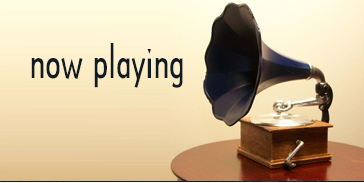 It’s not the usual through-line play; more of a series of jazz riffs, not a symphony. Oliver has the charm and charisma to carry the show. Rutledge provides the comedy relief, especially when doing his best used car salesman pitch in explaining why he prefers women who like him for his money. 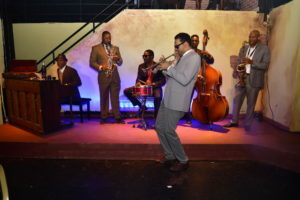 The rest of the cast, including Eddie Goines as pianist Wynton Kelly and Micheal D. Ricks as drummer Jimmy Cobb, all deliver fine support under the assured direction of Ben Guillory. An added bonus is the trio of live jazz musicians—Marion Newton on bass, Ricardo Mowatt on percussion and playwright Ross himself on saxophone. 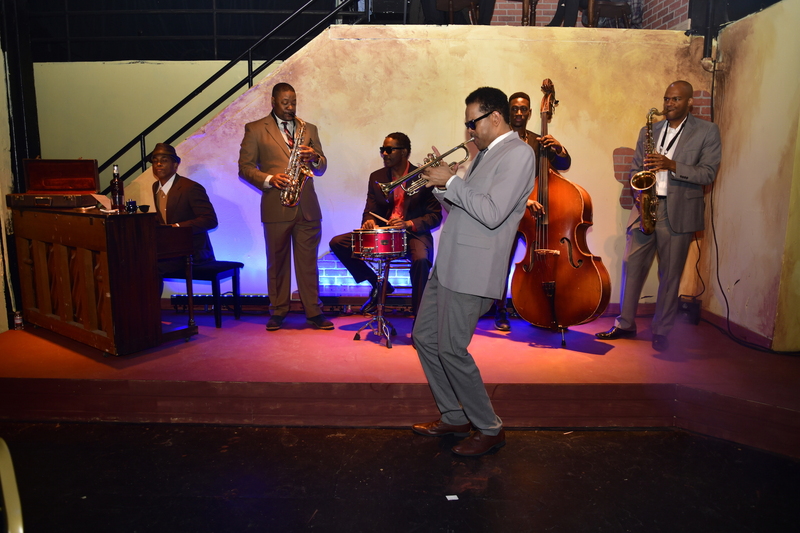 Robey, along with the expertise of set designer Ernest Gardner, have converted LATC’s Theatre 4 into an intimate cabaret room where the audience sits at cozy four-tops to view the action that happens on stages around them. 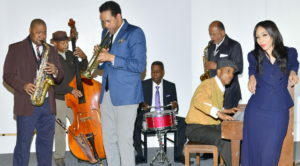 With Birdland Blue, Ross, Guillory and company have created an immersive dive into vintage jazz.